The ELI 350- MANUAL HEAT PRESS is an easy to handle manual printing machine. 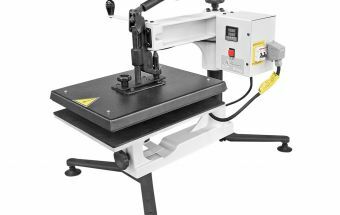 This is a interchangeable heat press that can be easily adapted to several functions by the use of other flat platens, cap platen and dish platen. It allows for printing sizes up to 350 x 450mm. The printing area is the same as the size of the platen. The pressing operation is differentiated thanks to its strength enhancer that makes the work much more practical and causes less fatigue to the operator. The swing-away system requires very little maintenance and is more convenient to the operator, also because his contact with the heat of the thermal platen will be minimized. The upper heating platen features double Teflon coating, casted-in heating resistance and milled in aluminum to provide a uniplaten pressure over the entire platen area. The Metalnox range of manual interchangeable heat presses allows the operator to change thermal platens as necessary, for example, the flat platen can be exchanged with bonnet or dish platens.